I was lucky enough to be in NYC on three separate occasions over the last three weeks. Some for work and some for fun. The first was a quick one night road trip with the guys, the second was for business, and the third was with my wife as we had a long weekend without the kids. I live outside of Philly and love to go to NYC, but normally don’t make the two hour drive three times in three weeks. However, as a music junky, I would never pass up the opportunity to see one of my all-time favorite bands who happened to be headlining Madison Square Garden for 13 straight shows. Phish made big waves (see what I did there?) 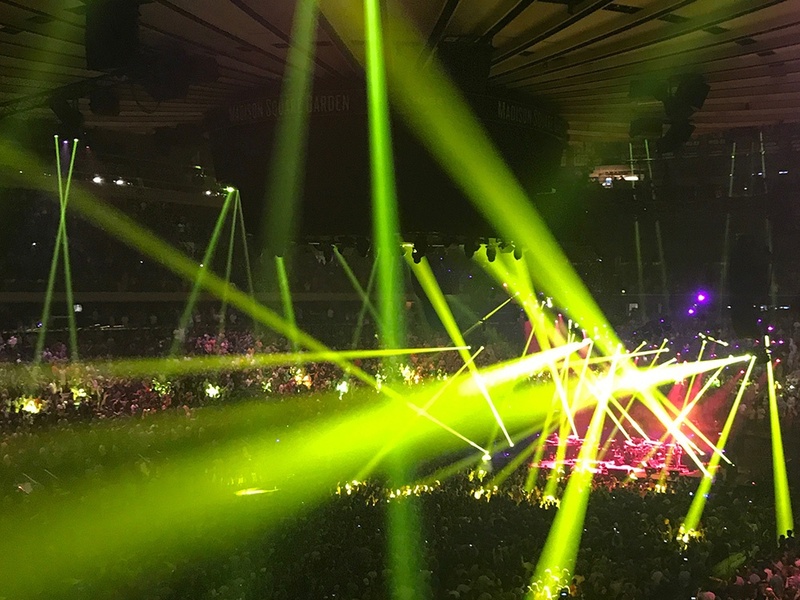 in the jam band music scene, and even dipped a little into the mainstream (again), with their 13 night run at the famous Madison Square Garden from 7/21-8/6. This run at MSG was aptly dubbed “The Baker’s Dozen”. Over the past 18 years, my career has been spent in sales and marketing, with a very specific focus on retailers during the last ten. The past three years has seen a huge shift in marketers focusing on the concept of Experiential Marketing. Side note: Engagement marketing, sometimes called experiential marketing, event marketing, on-ground marketing, live marketing, participation marketing, or special events, is a marketing strategy that directly engages consumers and invites and encourages them to participate in the evolution of a brand or a brand experience. Rather than looking at consumers as passive receivers of messages, engagement marketers believe that consumers should be actively involved in the production and co-creation of marketing programs, developing a relationship with the brand. There is plenty of evidence that suggests today’s consumers—especially millennials—are shifting spend from buying material goods, to buying experiences, or perhaps more so, buying fun. One recent study found that 72 percent of millennials prefer to spend more money on experiences than on material things. This is a trend that will ultimately force big, established retailers to adapt and get creative. In other words, retail will never die, but it will require the implementation of experiential marketing to support the sales of goods (think Saks Fifth Avenue’s prison-inspired workout experience, Conbody, to drive foot traffic to their flagship store). It’s just the natural evolution of the consumer journey. Currently, there are several brands nailing experiential marketing including Vans and Red Bull. Game of Thrones fans in the UK were recently treated to a life sized dragon skull sitting on Dorset Beach—courtesy of UK streaming giant Blinkbox—to coincide with the release of series three. However, I have never been so blown away by the experience that Phish treated their phans to over this 13 night stretch. During the three jaunts I made to NYC, I was lucky enough to grab four different shows. This was never the plan, but after I went to the opening show I knew I had to not only hear more of the music, but to see what they were going to do next, and this is where they (last time) hooked me. Phish has been around for a long time, since 1983 to be exact. They have really done everything there is to do, and now seem to be having more fun than ever being creative with their loyal following. Not only are they extracting more loyalty from their base, but they seem to be acquiring new phans like never before. I spoke with several people in the seats around me who told me this was their first time seeing Phish, how excited they were to be part of The Bakers Dozen and what an amazing experience it was. To help you better understand Phish’s success with experiential marketing, I want to lay out a couple of the tactics that they used in creating this experience for their consumers. Buy 10 shows get 3 free: Yes there are Phish phans who are so dedicated that they went to all 13 shows. Even more impressive? Phish didn’t repeat a single song in any of those shows! Box of Tickets: If you bought all 13 shows, your tickets showed up in a box that resembled a dozen donuts and all of the tickets were in the shape of donuts. Every night had a featured flavor: As an example, the opening show which I attended, was coconut. They handed out coconut donuts (while they lasted) to patrons as they entered the venue. Cover Songs that align with the feature donut flavor: Strawberry icing night (Strawberry Fields Forever by The Beatles), Jimmie Sprinkles Night (The Wind Cries Mary by Jimi Hendrix) and the best one that I personally was there to hear was on Boston Cream night, where they did a blended cover of More Than A Feeling by Boston, combined with Sunshine of Your Life by Cream (they dubbed it Sunshine of Your Feeling). At the end of the final night, Phish was able to hoist their Baker’s Dozen banner—which will remain indefinitely provided no other artists top the feat—into the MSG rafters to commemorate the unique run. The only thing missing, which theme parks are starting to exploit into the experiential marketing realm, is the aroma of the fresh donuts being pumped into the arena. The takeaway? If marketers aren’t thinking about how to bring a more audio-visual, multi-dimensional experience to their campaigns, they will soon be missing the boat (actual last time). Consumers’ mindshare and wallet share is starting to shift from “stuff” to real life events and experiences. Every brand has the ability to augment or supplement a bit of experience into their test advertising budgets. See if this tactic works for your brand, test and fail, and test again. And if you want to look at a case study of experiential marketing to draw from, just check out one of the thousands of articles that have been in written in the last couple weeks about The Bakers Dozen. For more strategy on how your brand can take your marketing efforts to the next level, reach out to Pepperjam today.